Home › Painted stork › Asian openbill - Anastomus oscitans. The Asian openbill (Anastomus oscitans) belongs to the family Ciconiidae. The Asian openbill is a large wading bird of stork family. The Asian openbill is distributed in the Indian subcontinent and Southeast Asia. The openbill is found in Pakistan, India, Nepal, Bangladesh, Sri Lanka, Burma and Thailand. 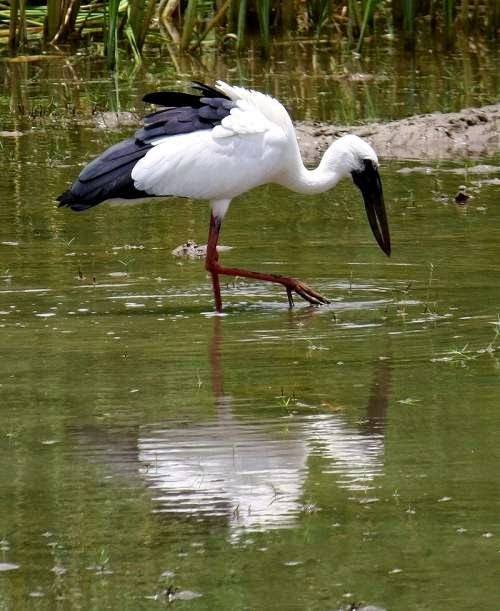 The International Union for Conservation of Nature (IUCN) had categorized and evaluated these openbills and had listed them as of 'Least Concern'. The Asian openbill is a large bird, measuring 80 cm in length and 70 cm in height. The bird is greyish white in color with glossy black wings. It has a forked black tail with purple or greenish sheen. The lower and upper mandibles are arched towards one another with a gap between the curves. The younger birds do not have the gap. The mandible is greyish with brush like structure in the cutting edges. The relatively short legs are greyish or pinkish. The main feed of openbill is apple snail. They also feed on fish, crabs and frogs. They are seen foraging in flocks in inland wetlands, marshes and ponds. They breed during July to September in northern India and November to March in southern India. They make platform of nests on half-submerged trees. The nest may have two to four eggs. Both the openbill parents take turn to incubate the eggs. Current topic in Birds of India: Asian openbill - Anastomus oscitans.